You can NEVER have enough chocolate, especially when it provides such healthy benefits!! 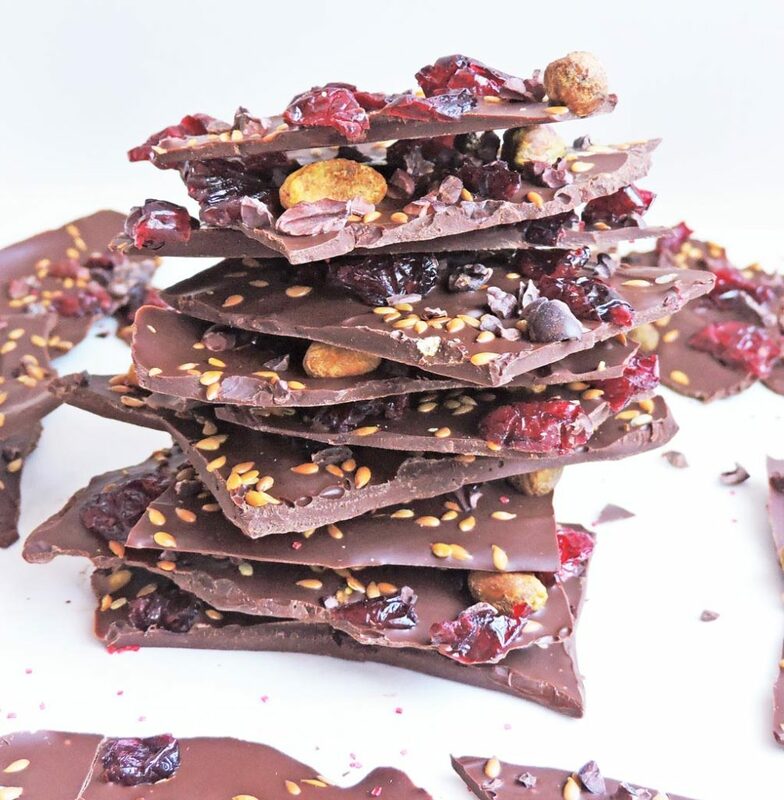 My Superfood Dark Chocolate Cranberry Bark is a much healthier alternative to the average candy bar and is also nutritious! #winning ? Okay, y’all, so Valentine’s Day is almost here and I’m sooo excited! (It really doesn’t take much to excite me, if you haven’t noticed that already! Lol) I LOVE Valentine’s day because I’m super sappy! Lol! I absolutely adore the love stories on the Lifetime and Hallmark channels! Even though I’m almost certain how every love story ends, I still enjoy watching them and feeling all mushy inside! ? The other reason why I LOVE Valentine’s Day is because of the chocolate!!! Like I’ve mentioned several times before, I’m completely obsessed with chocolate! Chocolate is the “cure-all” for most of my problems! Lol! It just puts me in a happy place! I also seemed to have passed this obsession along to my kids! 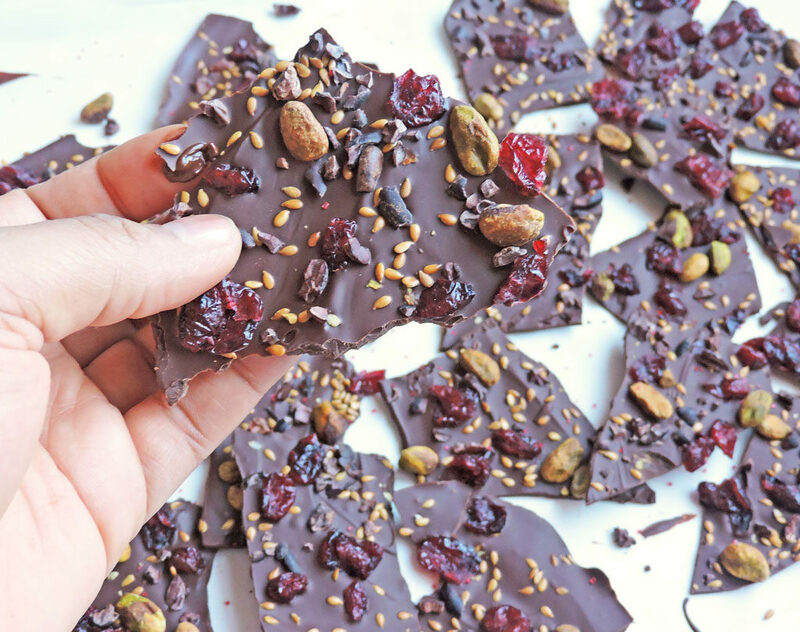 They love anything with chocolate, so you can just imagine their excitement when they realized I was making this Superfood Dark Chocolate Bark! My husband is not a big dessert person, so he was not as thrilled…but I’ll tell you more about his reaction later! Lol! For Valentine’s day, most people indulge in tons of chocolate bars and boxes of those wonderful Whitman’s Samplers! Don’t get me wrong, I love that stuff, but I wanted to make a healthier candy option and not feel completely horrible if I indulged in 1,2, or 5 pieces! Lol! The ingredients that I chose to include in this recipe meshed so well together and also provided some great health benefits! 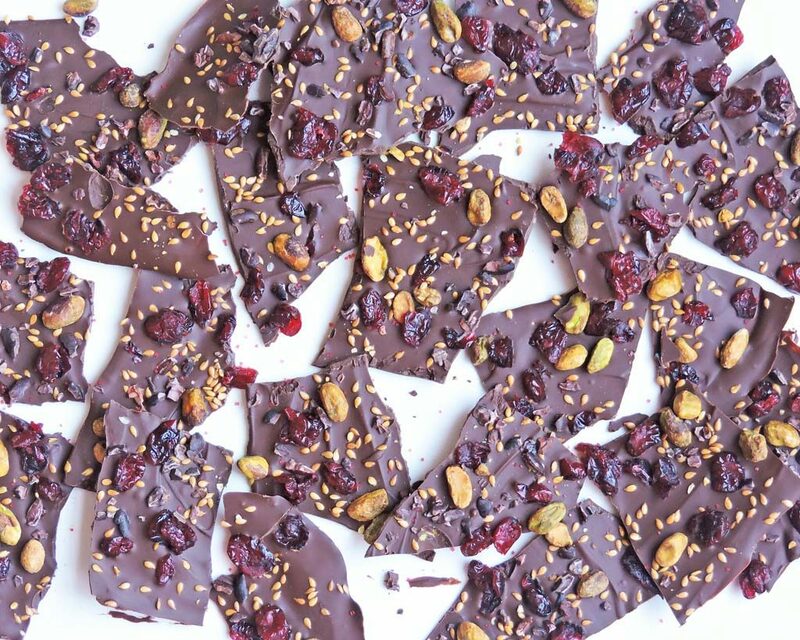 I chose to use dark chocolate, cranberries, pistachios and cacao nibs because they are packed with those wonderful antioxidants! I also added flax seeds, which contain a great amount of fiber for a healthy gut! This recipe was very easy to make! I melted my dark chocolate in the microwave for amount 2 minutes, stirring about every 30 seconds until completely melted. I added a little coconut oil to help the chocolate spread smoothly and evenly. After that, I spread the chocolate into a very thin layer on a sheet of parchment paper and sprinkled the rest of the ingredients on top. Refrigerate for about 1 hour and then break apart into pieces! See, easy peasy! 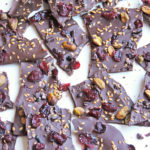 My kids LOVED this Superfood Dark Chocolate Cranberry Bark!! And guess who else loved it?? Yep, you guessed it, my husband!! The man that claims he doesn’t like to eat very many sweets! Lol! Right after the bark was set and broken into pieces, he ate about half of it! He told me that the cranberries were a very nice touch! If my husband devoured this, then I know that you will enjoy it too! 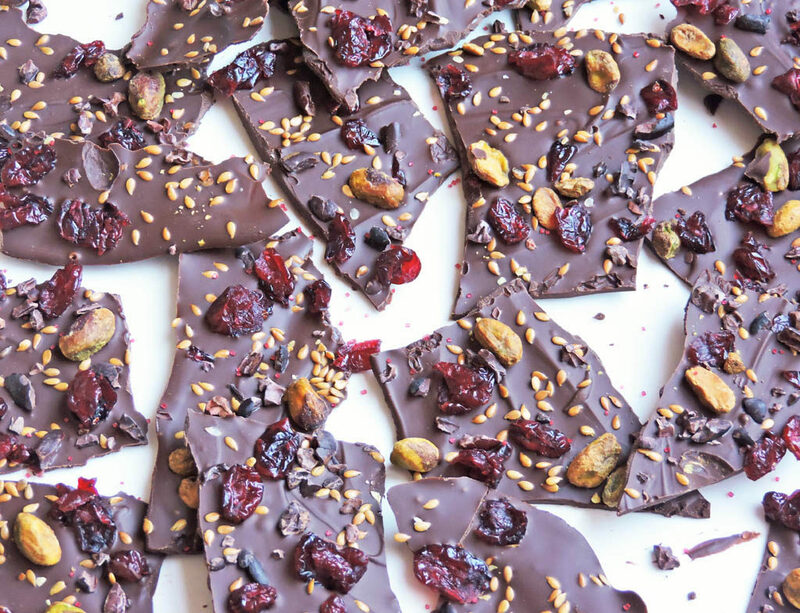 So hold off on the usual box of chocolates this Valentine’s Day, and make a batch of this Superfood Dark Chocolate Cranberry Bark instead! Be sure to follow me on Pinterest for more recipe inspiration! In a medium, microwave-safe bowl, melt the dark chocolate chip morsels for approximately 2 minutes; stirring every 30 seconds until completely melted. Once chocolate is melted, stir in coconut oil. With a rubber spatula, spread chocolate into a very thin layer on the parchment paper. Evenly sprinkle pistachios, cranberries, cacao nibs, and flax seeds on top of chocolate and refrigerate for about 1 hour or until set. Once bark is set, break into pieces and Enjoy! Store in refrigerator. Recipe will make approximately 25-32 pieces depending on how small you break them up. Cranberries with chocolate is my weakness!!! I might just have to give these a try! You’re gonna love it! Thanks!! You had me at Dark Chocolate, but then you added pistachios and dried cranberries and now I’m putting shoes on to run to the store. This recipe looks delicious.